For those of you who play Xbox Live, the ‘481 patent (aka “Quitters Play Together”) will be right up your alley. This patent describes a method for matching users with similar backgrounds. Whenever a player logs in, an input is sent to the host whereby the information is analyzed and the player is placed into a session alongside other users determined to match the requesting player. A simplified matchmaker matches users of a computer network, such as the Internet, based on the number of games the users have abandoned. A one-action input is received at a requesting client application executing on a computer connected to the computer network. Next, information that is stored within the computer is collected. The information is stored within the computer using a process that is unrelated to and separate from the one-action input received from the user. Then, at least one message is sent from the requesting client application to a host computer connected to the computer network containing information relating to a request for initiating a matchmaking process on the host computer that matches requesting user into an online interactive session along with other suitable users, such that each suitable user is connected to the computer network through a client application compatible with the requesting client application. 1. 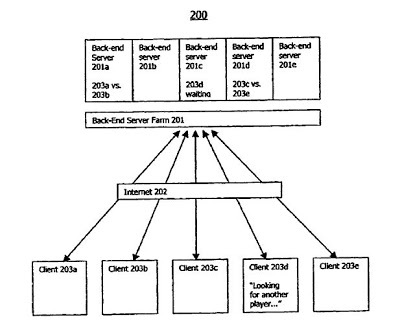 A method for matching users over a computer network, the method comprising steps of: receiving a one-action input at a requesting client application executing on a computer connected to the computer network, the one-action input being received from a requesting user associated with the requesting client application; sending at least one message from the requesting client application to a host computer connected to the computer network, the message containing information relating to a request for initiating a matchmaking process on the host computer, the matchmaking process matching the requesting user into an online session instance along with other suitable users automatically, without further input being received from the requesting user associated with the requesting client application, each suitable user being connected to the computer network through a client application that is compatible with the requesting client application; receiving at the host computer the at least one message from the requesting client application; and matching the requesting user into an online session instance with other suitable users determined to match the requesting user, wherein the step of matching the requesting user into an online session matches the requesting user during a first predetermined period of time based on information relating to at least one operating parameter of the computer on which the requesting client application is executing and at least one user-defined parameter relating to the requesting user, wherein when the requesting user has a predetermined user status with respect to the requesting client application, the step of matching the requesting user into an online session matches the requesting user during a second period of time with other users that have the predetermined user status with respect to a client application corresponding to the requesting client application, wherein the predetermined user status based on a predetermined number of abandoned games.